Sometimes, it’s best to stick to the basics. When it comes to cooking, you want a meal that’s fast, easy and requires the use of ingredients you can already find in your kitchen. While simple to prepare and make, our basic fried eggs and potato recipe will taste like days went into its preparation. Although most people know how to fry an egg, they’ll be wondering what you did differently to make it so tasty. Want to know how to make a basic fried egg recipe your friends and family will be raving over? Check out this basic fried eggs and potato recipe! After rinsing and scrubbing your potatoes, use a chopping knife to dice them into small cube pieces. Drizzle olive oil into a medium skillet over medium heat. Once the oil begins to sizzle, add your potatoes, salt and pepper. Cover with a lid and reduce the heat to medium. Allow the potatoes to cook for roughly 8 to 10 minutes. Remove the lid and turn the potatoes. Add your chopped onions and peppers. Mix the contents. Place the lid on top and turn the heat down to medium-low. Allow the vegetables to sit for another 4 to 5 minutes. Once the potatoes begin to cook and slightly brown, remove the lid and add your oregano and thyme. Use a spatula to mix the contents entirely. Add ¼ cup of butter to a medium skillet and cook over medium heat. Tilt the pan to cover the entire skillet in melted butter. Once the butter begins to melt, carefully crack your eggs and add them to the skillet one by one. Cover your pan with a form-fitting lid and allow your eggs to sit for approximately 5 minutes. Remove the lid and wedge your spatula under the edge of the egg. Remove the egg and sprinkle with cheese. Add a spoonful of potatoes and several eggs onto each plate. Serve immediately. Put a little pep in your step in the morning by rolling out of the right side of the bed — the one nearest to the kitchen, of course! 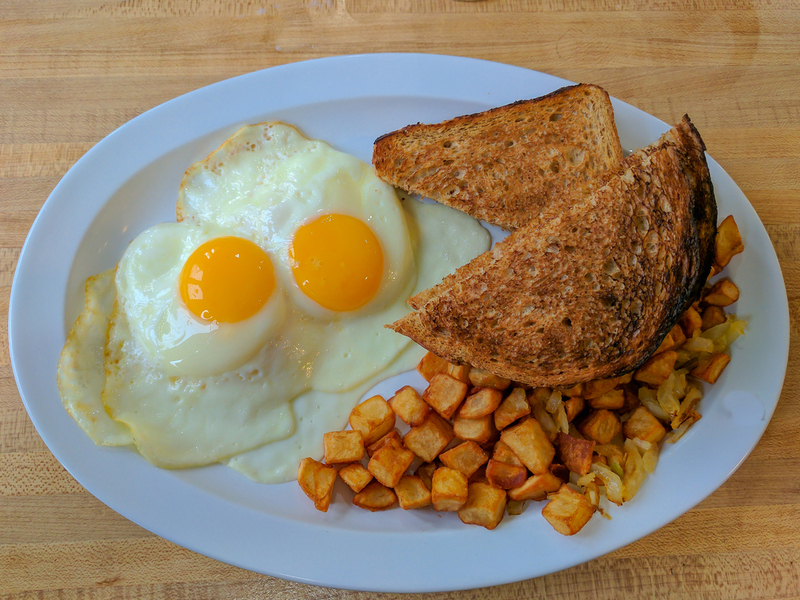 There’s no better way to kick off your day than by enjoying a delicious egg straight from the farm. If you were wondering how to cook a fried egg, we guarantee you’ll find our recipe a hassle-free way to enjoy your favored breakfast food — no chef level skills necessary! When you bite into your breakfast, you deserve fresh quality ingredients that make sure you get the right start to your day. At Sauder’s Eggs, we provide families across the nation with farm-fresh eggs at one affordable price. Use our store locator to find our eggs at a store near you!